Today, I had good news and bad. The good news was, that I found my watch which had gone missing months ago. 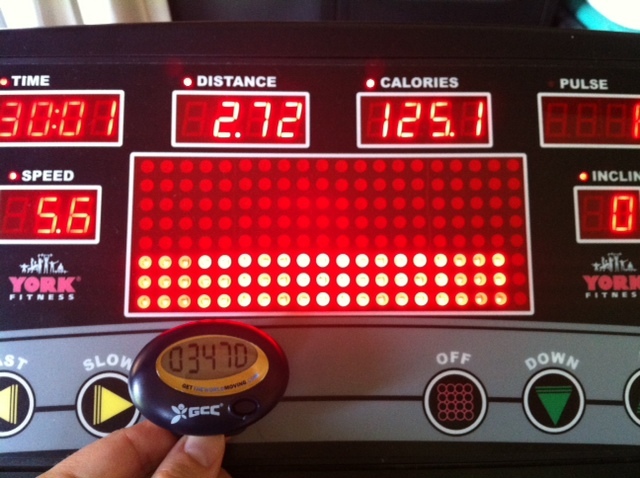 The bad news was that the watch was on the treadmill (the walking thing which one is supposed to exercise on). The Global Corporate Challenge made me rediscover my treadmill today, if for no reason other than team-guilt – the other team at work is winning, so it’s time to get walking. What was surprising (other than finding my watch in the very same place that I’d lost my spare car key only six months earlier), was how much effort it takes to walk off Tim Tams. Especially, the six dark chocolate Rum & Raisin ones I ate yesterday. As the picture shows, half an hour of walking (at an easy pace) only burns off one Tim Tam (90 calories or 400 kilojoules) and a bit. I’d never counted calories before, nor dieted, so this was quite a shock. Furthermore, the walk only clocked up three and a half thousand (ish) steps, when the other teams’ averages are around 11,000 per day. Hmmm. All things considered, I’m thrilled that I’ve found my watch and a new way to watch what I put into my mouth. (Those who know me well probably wouldn’t call me a convert, just yet). I’m back in Brisbane to lovely cool weather. I like to walk around West End and the city. It is fun to wander and discover your own city. I’m not much interested in treadmills, I do, however like Tim Tams. Brisbane is nice to walk around at this time of year, particularly as it has bounced back well from the floods. Has everything returned to normal in your neck of the woods? Treadmills are good (at least, in theory) when you’re stuck indoors, supposedly doing something else (like a university thesis). I had a wander around the river yesterday and it is looking pretty good. Our house near the West End ferry is still a mess. We are meeting with the builders tomorrow to discuss the next step. You wouldn’t want to be hanging by your toenails.You would think the insrers would be in more of a hurry since they are paying the rent while the house is not finished. Sorry to hear that. How dreadful. Hope it resolves soon!